« Race 9: Last Wet Season Race. 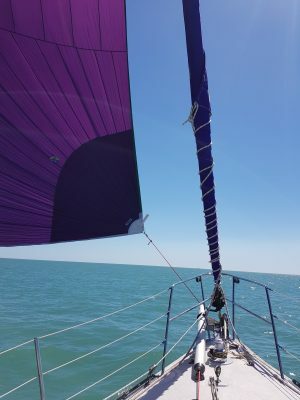 Since Cyclone Marcus hit Darwin in March 2018, we have been using a borrowed head sail, which we are most grateful for as it meant we could keep on sailing during the weekends. 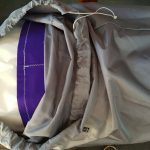 We’ve been using the fabulous dry season weather to refine skills regarding adjusting the sails, presenting the main sail, noting the tell tales and taking a more detailed note of the environment in which we are sailing. For example, noting where the wind is coming from and how to adjust the sails accordingly whether that be by use of the traveller or main sail sheet. Also, adjusting the cars for the head sail to get a more refined trim. So, while we have been busy with sailing and general maintenance, sails have been ordered. 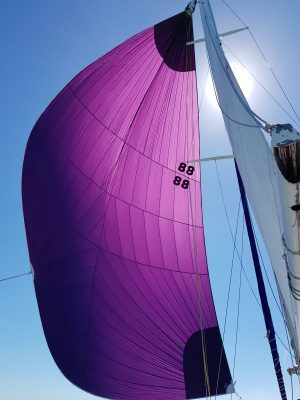 The head sail has a purple trim. As you can see in the picture. So, we thought we may as well get a new main. A little bit of an extravagance but it seemed logical as her current main was well aged. Now we know that the sails are new and fresh and current. Basically, it started with the spinnaker. So, I’m kinda working backwards here. After much research and deliberation, we decided on an asymmetrical spinnaker. Mainly for ease of use. When we cruise full time, there really is no way that Pete or myself will be able to manage a spinnaker pole on our own, it’s far too heavy and cumbersome to maneuver. Pete gave me full reigns on colour and design. Colour was easy, the design, so very complex. I looked at so many designs, so much so that the mind gets cluttered with colours and colour matches and all the related costings. Sometimes, simple is best. Less is more. With that in mind, purple will do just fine. What do you think?